YDMV reached the 50k visit mark yesterday. Thanks to everyone of you who has stopped by. I did a little quick math and that is more visits than test strips on the floor in the same amount of time - Impressive because with two kids pumping, we get a hell of a lot of strips on the floor. Is it possible for a strip to get into the trash without first hitting the floor? 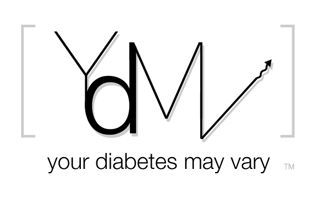 YDMV started because my daughter challenged me to share my views on type 1 and parenting. Thanks Kelley for throwing down that gauntlet. Thanks for the challenges you, Blair, Connor and Delaney share with mom and I every day. Each and every new experience you guys bring us has been a joy. OK some take a little while to have the joy part come out but it always does. By the way Kelley is responsible for the visual make over that comes with the 50k mark. Hope y'all like it. It seems a little ironic that YDMV crosses this milestone while I have been spending a lot of effort on another creative challenge. This one I brought to Kelly - a turn about is fair play. While I may have let posting to YDMV slip a little, our focus on the DOC has not. I think y’all will really like the results of that other project. Stay tuned. In the mean time please know you readers have given me back a lot thanks. LY/MI. Thanks for bringing those sage words YDMV to the world, and your contribution to uniting a fine community. LY/MI right back. Thank YOU Bennet for sharing your journey as a parent. You have helped a new-to-the-D parent cope the last 18 months. Thank you for being part of the DOC. LY/MI comin' your way from the Sparlings. Super job! Congrats to the whole family.